Last month, Velveteen Dream made his Twitter account private after this now deleted tweet was posted ahead of NXT TakeOver: Phoenix. "I Know My Worth. The past year I've created a special atmosphere at NXTTAKEOVER. Until WE* can come 2 an agreement as 2 what MY WORTH actually is, there won't be any appearances or performances from "The Velveteen DREAM" or my likeness." Dream did not wrestle at the latest TakeOver, but did have two segments: walking into the building and then being shown sitting in the crowd. He also won the WWE Worlds Collide tournament to earn a title opportunity of his choice. On this week's NXT he challenged NXT North American Champion Johnny Gargano. Making his account public again, earlier today Dream called out a question from WWE's Instagram asking the WWE Universe which WWE Hall of Famer they'd like to see return to the ring. Dream was not a fan of WWE promoting past generations of Superstars rather than focusing on the current group, calling them "The Dream Generation." "NO. They Had Their Time. It's Past Their Prime. If I wanna see these guys I'll spend $9.99 on the NETWORK. Use What U Got b/c We're More Than A Generation of Dreamers. WE ARE The DREAM Generation. And YES I am The One 2 Talk. #MoneyWhereTheMouthIs"
After last month's TakeOver, Triple H spoke to the media on his thoughts about Velveteen Dream and bringing the 23-year old along slowly. "It's all little steps of being a star, right?" Triple H said. 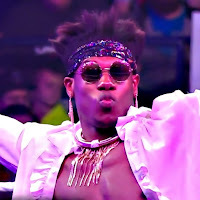 "The one thing about Velveteen Dream—I think that everybody fails to realize with him—is he's been in the business for a minute. How far he is and how big of a star, and how he gets this, it's awesome. I think you want to make sure he takes the right steps to get there in the right manner, so that it all works in the best way possible and doesn't become too much, too soon, in the wrong way where you put him in a position where he might not be ready for it, or could fail. I don't see that in front of him, but it's always things you keep in mind."